An unprompted recommendation from your client to a peer gets you hired with no competition. Your client’s unprompted recommendation is the most powerful indicator of a superior relationship, signaling your client has made the rare emotional investment in your relationship. 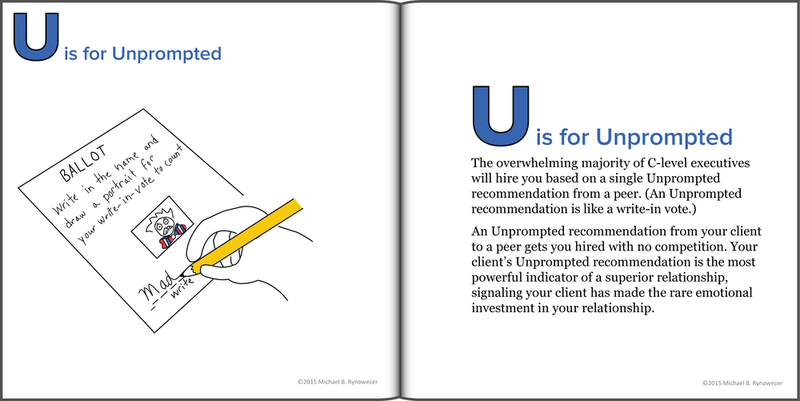 U is for Unprompted—and the other 25 letters of the Client Service alphabet—can be found in my ABCs of Client Service. Open your eyes to a whole new way of providing superior client service to each and every one of your clients, while driving more business. Click here for more information on The Mad Clientist's ABCs of Client Service—and to order your copy today. Spend 26 minutes with the ABCs of Client Service and improve your client service immediately.